Photographers Kristina Sherk and Chris Crumley have been a dynamic pair for years with their underwater photography. 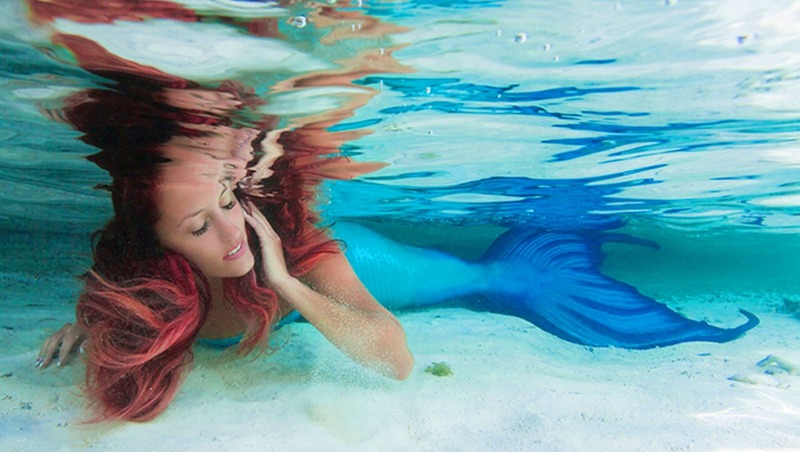 Crumley's shots of Sherk's mermaid modeling have gone viral around the world. However, Sherk decided to take on a new endeavor and create her own underwater art. Modeling underwater came natural to Sherk; she was swimming even prior to taking her first steps. This, coupled with a dance background, made it easy for her to keep her composure underwater. 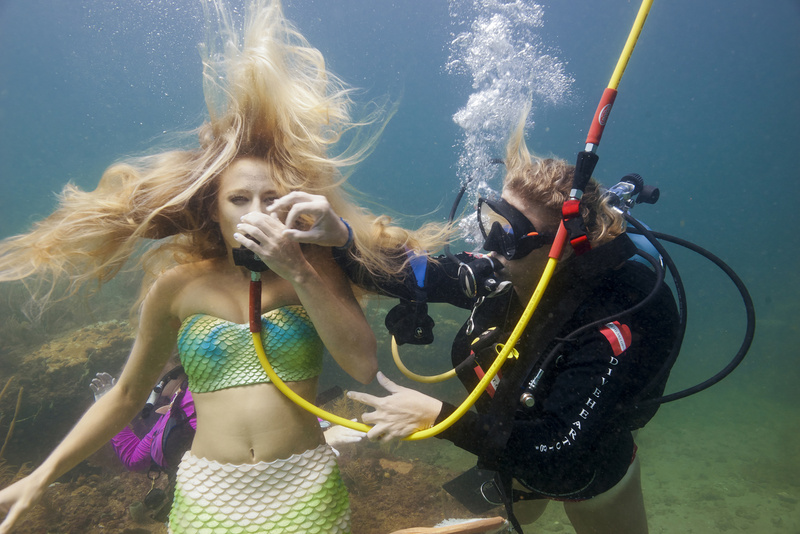 For the past few years, Crumley and Sherk, along with the Chesapeake Bay diving staff, have put on underwater modeling workshops in the Bahamas. This experience is a week-long training for models who are looking to learn from the talent these two provide for underwater work. I have been one of the mermaid instructors for the past four years, and it really is a highlight every year to take part in it! 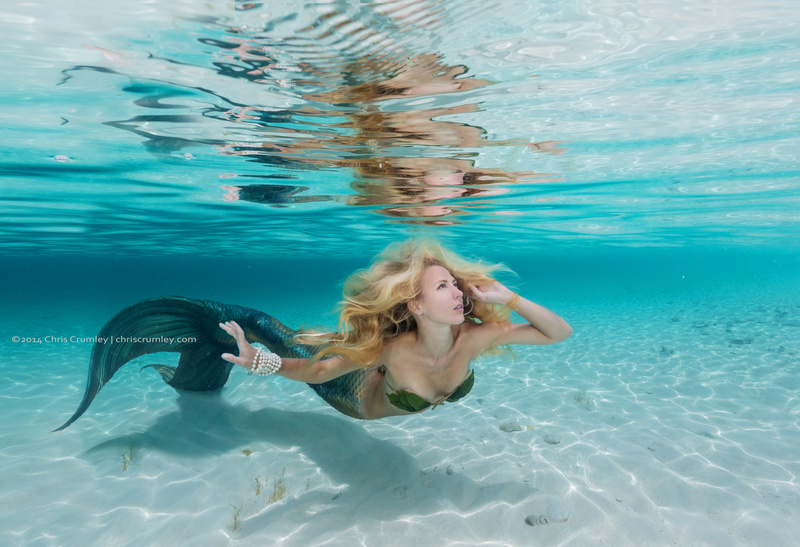 Sherk not only modeled for the image above, she also was the retoucher for Crumley on this work during their mermaid portfolio workshop. She runs the business under Shark Pixel. During these workshops, photographers get the chance to work with Sherk. Photographer Susan Knight is seen here with Sherk as she instructs attendees in underwater posing and photographer/model communication. The Bahamas workshops are an exciting way to be part of both worlds for Sherk. Between day trips as a mermaid and then into the night for an ethereal shooting opportunity, the experience is perfect for both models and photographers. 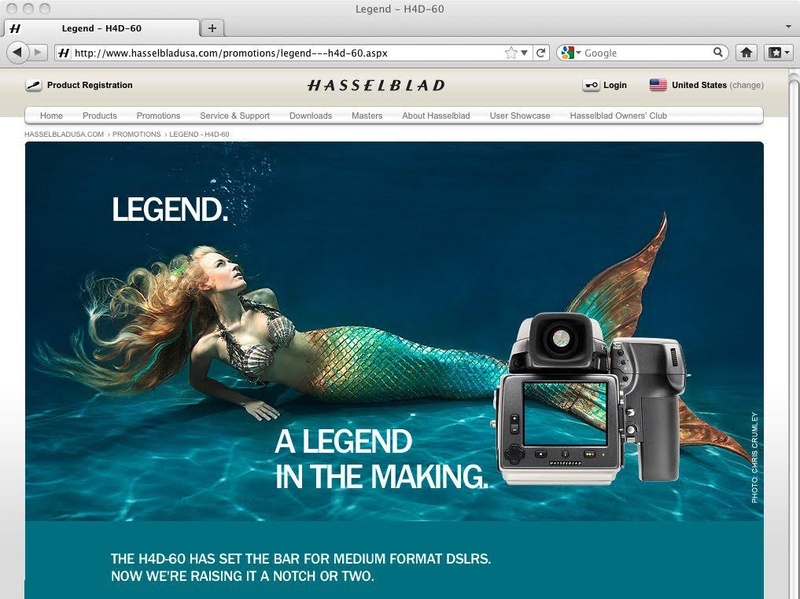 In 2011, Crumley and Sherk worked on shoots for Hasselblad Europe’s debut of their H4D camera and Hasselblad's new 60 megapixel digital back. The team for this project consisted of Safety Diver Dana Chapman with assistants Jackie Burwood, Christina Macfarlane, and Hasselblad's Paul Waterworth. As an underwater photographer myself, I knew the difficulties from a photographer's point of view. We have the vision in our own minds, and need to clearly and effectively communicate with the models. As the photographer, some of our difficulties lie within equipment, gear, and lighting. If diving deep, the photographers will have access to air tanks. I asked her what it was like on the other end of the camera, from the model's perspective. The most difficult aspect about modeling underwater is the sensory deprivation. You lose your ability to see, to hear, to speak, or communicate with your photographer. When I model deeper than 20 feet, I need to have a safety diver off camera, ready to give air from their scuba tank whenever the agreed upon signal is given. She went on to explain the importance of models keeping their composure and "not swimming to the surface in these situations due to the fact that the lungs will perforate. They have your life in their hands, so trust is huge." 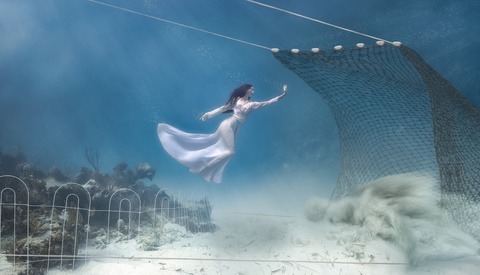 In the image below, Wilhelmina Stanton of Diveheart stands in as Kristina’s safety diver while doing promotional work for an underwater art installation by Andreas Franke. I asked Sherk what she felt was the most rewarding part of underwater modeling. She told me a story in which a woman approached her to say that one of the (Crumley and Sherk) photos was printed out on her mirror. This image helped the woman keep her hope alive while she was going through a two-year battle with infertility. "This is by far the most rewarding thing about creating these photos." Sherk had been an underwater model for over five years when she decided to invest in an underwater housing, purchasing the Ikelite housing and DS 160 strobe. She wanted to take advantage of her knowledge from being in front of it and in turn, translate it to create shots from behind the camera. Sherk's extensive client list for her work in headshots includes dancers, executives, and CEOs. So when presented with the opportunity to shoot underwater, she was up for the challenge. She told me: "I am a sucker for a challenge; that is something I have learned. I get bored easily and wanted to try something new. Transitioning from model to underwater photographer is presenting a whole new set of challenges that I am currently working through. That is what keeps me excited and energized." Her underwater photography clearly shows a level of understanding that many shooters coming into the field may not be aware of. Understanding clarity, color balance, and retouching issues are extremely different underwater compared to on land. To someone just starting out in the underwater world, the initial shot underwater can lead to confusion with the almost total loss of red in the water column. Sherk's extensive underwater modeling and retouching skills have given her the tools to jump into the game with a superb level of talent. When asked how she felt about the industry of underwater photography and where the field was headed, she replied that every day, she sees more and more photographers trying their hands at this type of shooting. "I think it is awesome that the industry is growing. But in the same vein, I hope that people realize the amount of work, time, money, and experience that it takes to create underwater images." The workshops are now not just about the modeling world for Sherk. Now, with her Ikelite in hand, she will be shooting beneath the surface. She shows off her work with model Ashley Soltis and Alfred Ellison Gregg IV; she is not not only the retoucher, but the photographer as well. Sherk feels it is still too early to gauge the difference in the industry from modeling to photographer on this side of her career. She is enjoying being on both ends of this type of shooting and plans to continue to her modeling during workshops put on between Crumley and herself. So while the underwater world of photographers needs to be on their toes with the work Sherk is producing, we need not fear that we are losing the mermaid. Thanks for the feature, Jennifer! I saw your interview with Grover. Your story is really awesome.